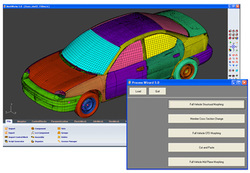 DEP’s Full Vehicle Morphing process wizard is an advanced high productivity CAE process Wizard that will automate following tasks in Full Vehicle Morphing. Full Vehilcle Mid Plane Morphing. 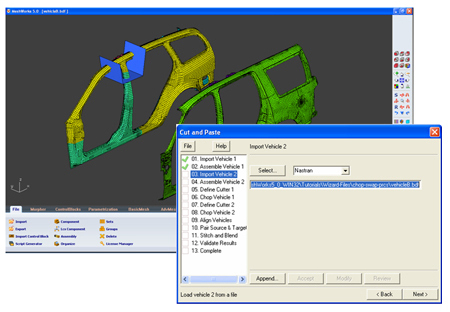 Full Vehicle Structural Morphing contains 3 important tasks i.e OCB creation, DCB creation and Morphing the Full Vehicle Mesh using OCB and DCB. User reads the Original full vehicle model and styling geometry of full vehicle into Wizard window, review the shape changes. 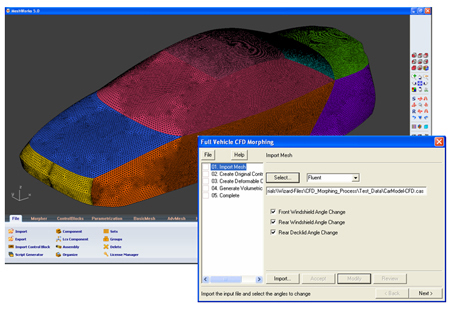 Wizard guides the user to carryout the various steps to create Original Control Blocks(OCB) and Deformable Control Block(DCB), subsequently Morphing the Original Mesh data to styling shape using OCB and DCB. 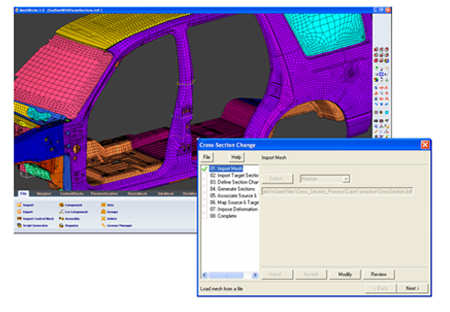 Member Cross Section Change is a process wizard which helps user to change cross sections of vehicle members to target sections given. From the full vehicle model, Cross sections of members will be extracted at target sections provided as well as define the boundaries to which shape change happened. The cross-section will be morphed to stying sections and mesh between boundaries will be updated to get smooth variation. Full Vehicle CFD Morphing contains 3 important regions to be morphed in full vehicle CFD model i.e front wind shield angle, rear wind shield angle and Rear deck lid angle. First of all, User create Orginal control block, then enter the values for change in angles. Deformable Control block will be created automatically based on change in angles specified. Finally, Full vehicle morphing will be carried out using Control Blocks created. Cut and Paste is a process wizard which helps user to build Analytical Mule Model rapidly using Advanced Mesh Cutting, Morphing and Stitching operations. Mesh cut in Feature/Cut function helps for cutting of shell meshes with cutting planes and Surfaces. Morphing technique helps in morphing the FE model to styling shape. Stitching function helps in automatic stitching of dissimilar elements.